Boy or Girl – A Blessing Either Way! In seven days we get to find out the gender of grandbaby #5! Well, Mommy and Daddy and Gramma (me) do! The rest of the family has to wait five days until the gender revel party. Grandpa and one Auntie have threatened me with torture if I don’t tell them! Somehow I’ll find the strength to keep the secret! Currently I have three grandsons and one granddaughter. G1 and G3 (the granddaughter) live three hours away from me so I don’t get to see them as often as I do the others. The boys outnumber the girls and the only girl is far away so I’m kind of leaning toward wanting another granddaughter. But of course the baby’s gender has already been determined and it is what it is! Boy or girl, G5 is Our Baby and of course our baby is the one we want, no matter what the gender! Mommy and Gramma have been talking about all the wonderful things about having a boy and all the wonderful things about having a girl and here they are! With three grandsons and only one granddaughter, we’re getting good at this “boy” thing! If G4 has a little brother it will be sooo cute! They could get into all kinds trouble together! If G5 is a boy he will be our boy! He’ll have lots of hand-me-downs! We’re stocked up on boy toys! G4 and G5 could share a room (and maybe someday mommy & daddy would really make the spare room into their office). Mommy, Gramma and Aunties would have fun buying some pink ruffly things! G3 would have a “girl cousin” to play with when the family gets together! If G5 is a girl she will be our girl! We could buy ribbons and bows and ruffles and tutus! We could buy dishes and dolls and tiaras and crowns! Mommy would have fun decorating the spare room for a little girl! Pretty Dresses – did I mention pink and ruffles and ribbons and bows and tutus?! G4 would take care of his little sister G5! G5 would have Daddy and Grampa wrapped around her little finger! 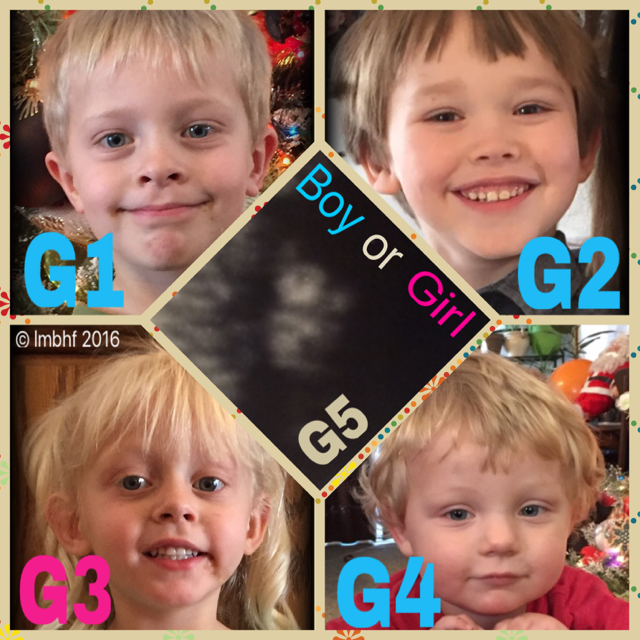 So Boy or Girl – G5 will be a blessing either way. « Candy Kiss Roses for Valentine’s Day!